A controversial anti-litter initiative in Latvia has been delayed after criticism that it was an affront to Russians and their commemoration of Victory Day. 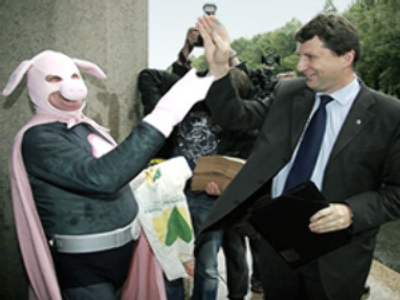 The Latvian government are using a mascot called Pig Man, who is meant to symbolise litter louts, in a bid to help clean up their streets. But the end of the campaign was to coincide with Victory Day, on May 8. Earlier a Latvian Russian-language daily, The Telegraph, had labelled the move to hold the so-called ‘Day of Victory over plastic bags’ a provocation. Several politicians also called the campaign an insult to veterans of the war and to the Soviet soldiers who gave their lives to liberate Latvia from Nazi occupation. If it had gone ahead, there were fears that it could have led to resentment among Latvia’s large Russian minority, or even a repeat of last year’s Estonian riots.